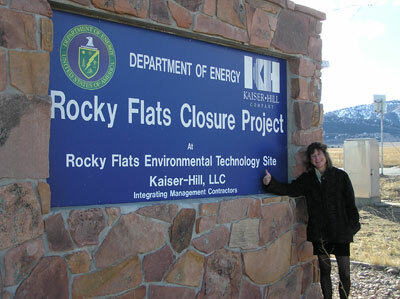 Soon after I was elected to the Boulder City Council in 1995, I was dismayed and very concerned when a citizen involved with the Rocky Flats Local Impacts Initiative (RFLII), a congressionally supported group tasked with determining future uses on the former nuclear weapons site, came before our City Council and revealed that recommendations from a subgroup, the Rocky Flats Future Site Use Working Group, included intense development of the former weapons site as industrial or office space. Not wanting to see any development on this contaminated site, I became Boulder’s representative on RFLII and later a founding member of the Rocky Flats Coalition of Local Governments (RFCLOG). Our group went on, with the support of now-Senator Udall and former Senator Allard, to enact the Rocky Flats National Wildlife Refuge in 2001, preserving open space in perpetuity on the entire 6400-acre parcel. 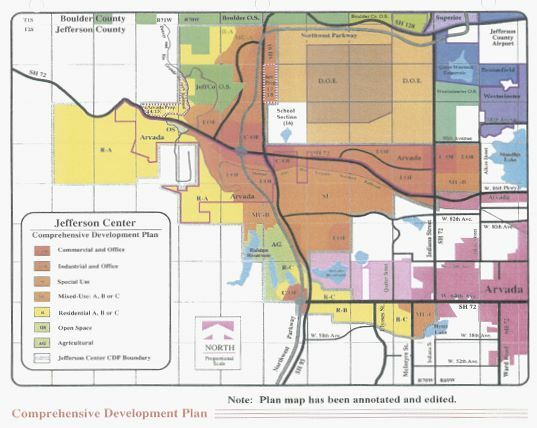 Also in the mid-1990s, I became very aware of a large land development proposal to the south of Boulder called the Jefferson Center. 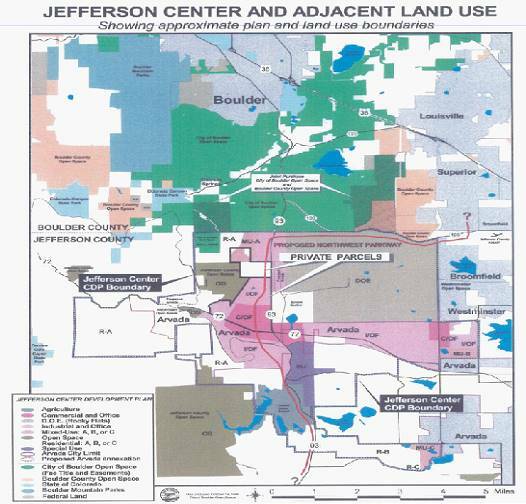 Starting in 1989, Jefferson County, the City of Arvada, the Jefferson Center Municipal District #1, and the Jefferson Center Associates (a large development interest) signed an Intergovernmental Agreement creating the 28 square mile/18,000 acre Jefferson Center. This new center or city would have been much larger than the City of Boulder, which in 1999 covered approximately 21 square miles. The City of Arvada’s intent was to annex the entire 18,000 acres. As originally approved, the Jefferson Center Comprehensive Development Plan could accommodate up to 25 million square feet of commercial/office, retail, industrial and residential development (more than 25 Twenty-Ninth Street malls and, at the time, more office space than in downtown Denver). This proposed development on our southern border would have been felt by our city through negative economic, transportation, and environmental impacts. Based on this potential development, we estimated a significant jump in traffic on Highway 93 north of SH 72 that would have increased the trip load from 16 to 81 thousand trip miles per day. This potentially would have introduced more than 29 million more vehicles per year from Highway 93 into south Boulder. At that time, the level of service at Broadway and Table Mesa was at level F.
Only 200 acres of the total 18,000-acre development were designated as open space in the Jefferson Center plan. Our acquisition of those critical 1500 acres in 1999 and later acquisition or conservation easement of an additional 700 acres has ensured that much of the mountain backdrop between Boulder and Golden is preserved. However, extreme development pressures continue on land along the eastern side of Highway 93 north of Highway 72, threatening to potentially create a solid wall of development along the western margin of Rocky Flats. 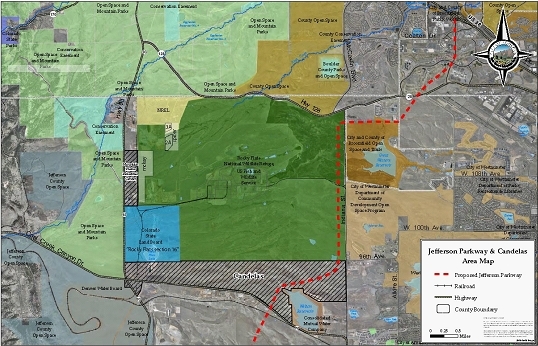 If built, the development would effectively make the Rocky Flats National Wildlife Refuge an isolated zoo rather than part of a wildlife corridor. The only publicly owned property that has a willing seller in this corridor is the 640-acre Section 16 site owned by the State Land Board. Open Space acquisition of Section 16 as a joint venture between the City of Boulder, Boulder County, Jefferson County, and the city of Golden provides permanent protection for biological resources, including wildlife living in wetland, riparian, and prairie habitats, and surface water and groundwater recharge. Furthermore, this acquisition protects our existing open space investments. Acquiring the land would provide the equivalent of natural resources injured at the site, directly proximate to the Refuge. Biological resources protected would include the federally listed and threatened Preble’s meadow jumping mouse, the rare fork-tipped three-awn grass, rare xeric tallgrass prairie, riparian vegetation, and numerous other native species including elk and deer. Two rare tallgrass obligate butterflies have been found on Jefferson County lands to the west. Not having development of the area would protect surface water flows though the Woman Creek drainage and preserve groundwater recharge. Section 16 is the largest unpreserved property near the Refuge. The purchase would create a buffer from development to the south, east-west wildlife connectivity, protection of a key wildlife and riparian corridor, and would secure the integrity of the Refuge and Front Range backdrop at the landscape scale. Providing this buffer will not only limit interference with use of the Refuge by associated wildlife, it will protect habitat that is highly dependent upon the integrity and management of surrounding properties. Environmental research has been reviewed by OSMP staff and it is clear that the habitat that will be protected under this proposal is unique and is of excellent quality. Section 16 has grasslands on its western edge that are rare on the Front Range of Colorado and is of ecological importance. The xeric tallgrass prairie are dominated by big bluestem, a grass that typically dominated prairies in the wetter climates of the eastern Great Plains that receive two to three times more annual precipitation than the Colorado eastern plains. The prevalence of mountain muhley on these grasslands is also quite rare, as this grass typically dominates at higher altitudes of the Central and Southern Rocky Mountains. Porter aster, a local species endemic to the Colorado Front Range, is also found on these grasslands. The combination of these species and others make this xeric tallgrass prairie unique among Colorado grasslands. Another unique feature of these grasslands on Section 16 is how stable they have been over a very long time period. The underlying soils are thought to have been geologically undisturbed for nearly two million years. The grasslands have escaped the impacts of urbanization and agriculture, as well as the high intensity livestock grazing of the late 19th century and early 20th century. The unusual combination of mountains and plains species on long- standing undisturbed soils of the Rocky Flats alluvium, along with the exceptional ecosystem stability and resistance to weed invasion leads to the conclusion that this ecosystem does have exceptional status. This grassland is a very high quality example of a vegetation community that does not exist elsewhere, a relic plant community that has existed possibly as long as two million years, and an ecologically stable community capable of maintaining its biological integrity in the presence of a multitude of invasive species. The xeric tallgrass grassland community is also found on the adjacent Refuge. It has been identified by the US Fish and Wildlife Service as a rare plant community and important natural resource for special consideration and management. The Woman Creek riparian area on Section 16 has also been recognized by the US Fish and Wildlife Service as an important wildlife corridor for many species including the threatened Preble’s meadow jumping mouse. The riparian area on Section 16 was fenced in the last couple of years in cooperation with the US Fish and Wildlife Service to better manage livestock grazing and its impact on the stream and threatened species habitat. In summary, I strongly urge the Boulder City Council to pass the resolution that would commit to work toward a regional vision of the Northwest Quadrant of Jefferson County. Given the action taken last spring by the Denver Regional Council of Governments supporting the Jefferson Parkway, the City of Boulder and Boulder County have limited remaining leverage in opposition to the transfer of the 300-foot right-of-way from the Refuge along Indiana. Also, given the progress made in the past year with Jefferson County where their vision of Section 16 has transformed from one of nearly complete development to one of regional preservation, I believe it is in the interests of not only the City of Boulder but the region to pass the resolution that will result in a binding intergovernmental agreement where Section 16 is preserved and incorporated into the Rocky Flats National Wildlife Refuge. To those who have concerns of plutonium and other contaminants along the 300’ ROW on the Refuge along its eastern border on Indiana, those concerns can and should be pursued through the Rocky Flats Local Stewardship Council, when and if construction of the Parkway begins.